The Spanish railway company RENFE, connects Madrid with the Madrid Barajas airport through the local train network service "Cercanías" C1 and C10 lines. 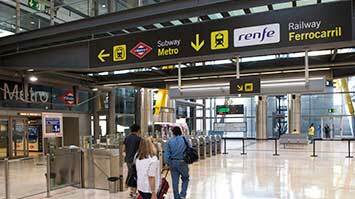 The train station is on the terminal T4 floor -1, and is called Aeropuerto T4. To move to the other terminals there is a shuttle bus service connecting the terminals. Príncipe Pío - Aeropuerto T4: 41 minutes. Estación de Chamartín - Aeropuerto T4: 15 minutes. Estación de Nuevos Ministerios - Aeropuerto T4: 22 minutes. Estación de Atocha - Aeropuerto T4: 29 minutes. Single ticket tariff is 2,60 €, valid for one journey in the two hours after it is issued. For passengers with long distance train tickets, or an AVE ticket (high-speed train), this service is free. Return ticket tariff is 5,20€, and outbound journey must be made in the two hours after the ticket is issued, but return must be made any time until the next day. The transport passes are also valid. The first train to Madrid (Principe Pío) leaves at 5.56 hours, and the last at 22.25 hours. Transport passes from Consorcio de Transportes de Madrid.